We are the Granite City Gearheads, FIRST Robotics Team 3244, from St. Cloud, Minnesota. Our team is composed of about 20 creative and diverse students, ranging from 9th-12th grade. Over the years we've had students from Apollo High School, Technical High School, Cathedral High School, St. John's Prep, Sartell, Albany, and Holdingford. Our rookie year was 2010, and during our regional, we were surprised to find ourselves competing in the final match as substitute robot! 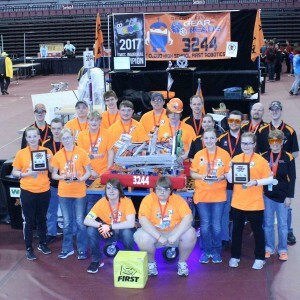 Our alliance took 2nd place, and we were so proud. In 2013, we went to the FIRST Championship in St. Louis after being selected by the top alliance at the Minnesota 10,000 Lakes Regional. We had an awesome time! This year we're looking forward to working with our new and returning members. We will be competing in this year’s FIRST Robotics Competition event at The Medtronic Foundation Regional at The University of Minnesota, Twin Cities. Each year, FIRST issues a new design challenge in the form of a game with tasks the robots must complete to earn points. Every game is played with six robots, in randomized alliances of three, working together in a 27 by 54 ft. field. The matches are 2 minutes and 30 seconds long. Robots begin the match with fifteen seconds of autonomous driving, before switching to remote control for the rest of the match. Here is a link to the game animation and a more in-depth description of this years game. We welcome visitors to come in and see what we're working on during our meets. We meet at Apollo High School in room C910, easily accessed through door 910 across from the tennis courts. We meet on Monday, Tuesday, Thursday and Friday during build season (January and February) and Mondays the rest of the school year (check our calendar) starting at 5:30, barring cancellations for weather or other interferences. If you have any questions feel free to contact us at granitecitygearheads@gmail.com.